External enclosures provide a great avenue for many professional & enterprise users in the media field looking for an easy way to store, backup data or transport hard drives. The ability to have slim, removable and heat dissipation are all critical features that truly protect, transport and store your data. With that said, Icy Dock is proud to introduce the MB559U3S-1S, 3.5" SATA III USB 3.0 slim aluminum external hard drive enclosure. The MB559U3S-1S uses an ultra slim fan-less design, to give the best portability in any professional environment. The height of the enclosure reaches just a bit higher than the standard 3.5" hard drive height under 2 inches, making it easy to place anywhere from your suitcase to your office drawer. 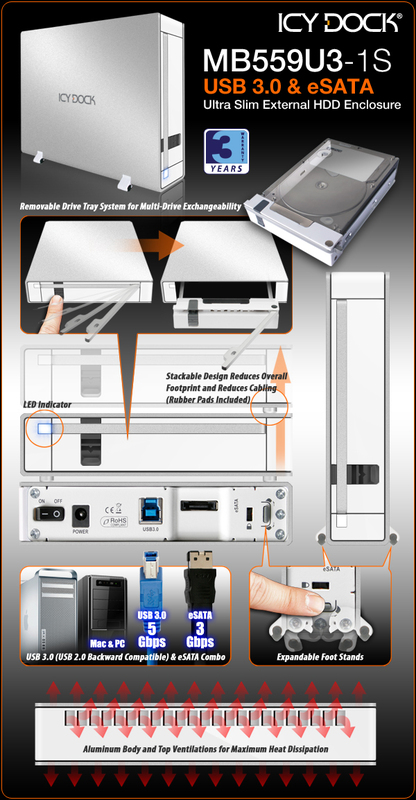 The hard drive removability compliments the portability of the MB559U3S-1S by utilizing a simple and easy tray system to swap and transport your hard drive to different locations. Meanwhile, the aluminum body properly protects, reduces the weight, and provides the best heat dissipation during operation. The MB559U3S-1S external enclosure is highly recommended to any professional users who require digital information management such as: Audio editors, DJ's, IT professionals, law enforcement agencies, military, government agencies, and more. * For single 3.5" SATA I / II / III hard drive. * Plug & Play USB 3.0 + eSATA combo for PC/Mac compatibility. for multi-drive exchangeability & maintenance capabilities. * Fan-less operation with aluminum body cooling & protection. * Built-in expandable foot stands and supports vertical position to save space. * Built in security slot for security cable kit. * 3 years limited manufacture warranty. * Takes 2.5" SATA I / II / III HDD & SSD with optional ICY DOCK 2.5" to 3.5" SATA HDD converter.